Nacho Libre is a 2006 German-American sports comedy film directed by Jared Hess and written by Jared and Jerusha Hess and Mike White. It stars Jack Black, and is loosely based on the story of Fray Tormenta ("Friar Storm", a.k.a. Rev. Sergio Gutirrez Bentez), a real-life Mexican Catholic priest who had a 23-year career as a masked luchador and competed in order to support the orphanage he directed. The film was produced by Black, White, David Klawans and Julia Pistor. The film was released on June 16, 2006 by Paramount Pictures. It received mixed reviews from critics and grossed $99.3 million at the worldwide box office against its $35 million production budget. 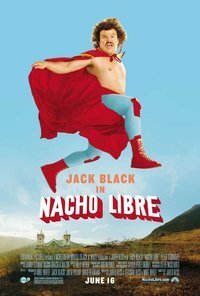 This webpage uses material from the Wikipedia article "Nacho_Libre" and is licensed under the GNU Free Documentation License. Reality TV World is not responsible for any errors or omissions the Wikipedia article may contain.